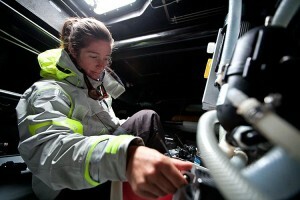 Molly has prior experience in the sailing industry from when she worked as a sailmaker in the North Auckland Loft, and as a watermaker technician for Spectra Watermakers. 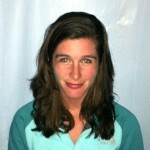 She left a job in international logistics and visas to join the team for the summer. 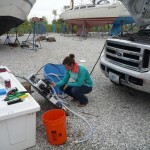 Molly has stayed with the boat since May getting it ready for the Transatlantic and has become familiar with Tidewater Shipyard, the Newport Shipyard, and now Endeavor Quay. We trained for the Transatlantic as much as we possibly could in the small three-month window we had. I found out I made the team in late April, I arrived at the Tidewater Baltimore shipyard the 5th of May, the Transatlantic started July 3rd. I left a desk job working in international logistics and talking to sobbing foreign exchange students as they navigated New York airports. After arriving at the boat I found myself trying to aim a cocking gun, scraping waterproof goo, stepping a 100+ foot rig, and a variety of other boat maintenance projects. I learned something new from each one, and each one became more complicated then the last. I moved from prepping projects, to learning how to lay carbon and discovering the soothing itch of carbon dust. I delivered Vanquish with a few other team members to Kings Point, but I didn’t find out what Vanquish was truly capable of until May 30th after the entire team had passed the Safety at Sea course and we went sailing. It was a blast. I realized that the boat was going slow if she wasn’t matching the wind speed. Aside from loving the boat I was going to spend the summer on, I realized that I was ecstatic to spend the rest of the summer with the team. The All American Offshore Team is unlike any other team I have been on; partially because this is the first time a group of promising young American sailors have been handed a 65 foot carbon high performance race boat to race across the Atlantic and then some. Partially because this is a group of talented sailors that absolutely love going fast, but mainly because there are some absolutely hilarious characters and great dancers on board. It was fun to explore the Ravers and the rest of the Newport scene when we hit the town in force after races and training sessions. In between fully moonlit warm training sessions, we prepared the boat for the worst of the Atlantic. We added a third reef, re-waterproofed Everything, repacked and tested lifejackets, added foot chalks for the bowmen… the list goes on. The race started and we headed out. I browsed through the start photos, Vanquish looked like a toy next the Leopard, Puma’s Volvo 70, Beau Geste, and Rambler; the giants of the Transatlantic. 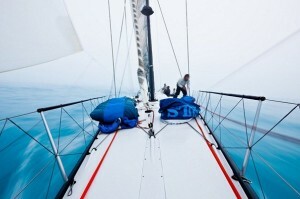 Our practice leading up to the race had been in light breeze, peaking at 28 knots, over calm moonlit waters. Several nights, we sailed under a completely full moon and our shadows chased us across the brilliantly lit deck. We spent the first days of the Transtalantic in heavy fog. At night it was like sailing through the black bowels of a coalmine and during the day you could see a few feet in front of the bow, slightly different then our training sessions. The team smiled, cracked a few jokes about seeing the competition, and kept pushing the boat. It was nice to see that no one was even slightly upset about sailing through conditions we hadn’t practiced in. We quickly fell into our watch schedule and slowly my body began to crave sleep after four hours and wake up after three ready for the next watch. Our five star burner and cooler spewed out macaroni mush daily but it always had plenty of water so I never had ‘the stuck to the side of your stomach and not decomposing ‘stomach ache of dehydrated freeze dried. After several days the temperature dropped. The water was the clear sapphire blue of the Caribbean and I was wrapped my warmest gear as the boat glided through a thick shroud of fog. We kept hoping a polar bear would swim up to the boat. No polar bears, but we did run into handfuls of dolphins, a few birds, several whales, and passed a sunfish. One of my favorite memories of the race was watching dolphins race through schools of fish at night. It was another dark night and the dolphins’ and fishes’ movements left phosphorescent tracks through the Atlantic. As the dolphins scared the fish they would scatter, leaving glowing skeleton thin lines that were interrupted by the dolphins’ thick trails as they weaved under and along side the boat like torpedoes. Every race has its disappointments, for me it was that we never were able to really stick the bow down in 35+ plus and let the boat run. Instead we ended up in an inevitable ridge that cut us off from England. Even though drifting is frustrating, it was fascinating to spend all day sailing up to a cloud formation on the horizon, pass it, and then wake up in the morning with the exact same clouds in front of you. Groundhog day. There was no wind, the sky stayed the same, we sprawled out all over the bow trying to keep the weight forward, and keep steadily riding the miniature puffs towards the Lizard.